Hello! 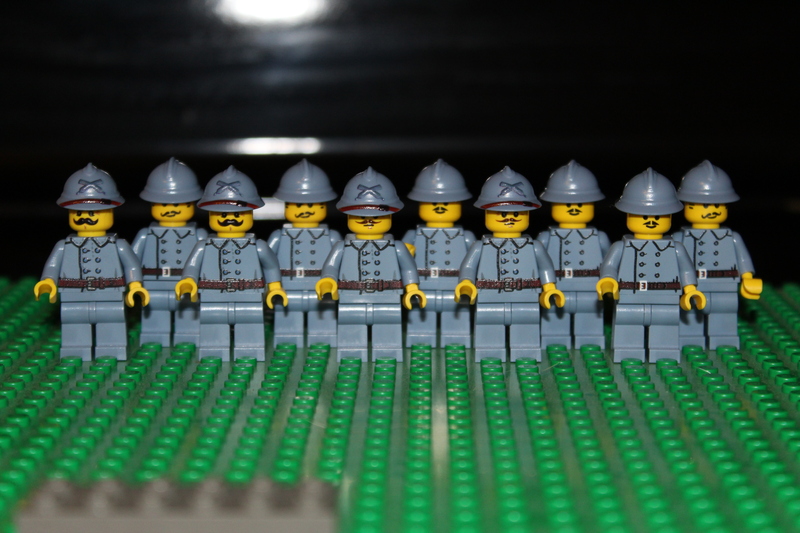 I'm finally pleased to share pictures of the beginnings of my Great War force! Pictured is The 13th Light Infantry Legion from the Wisconia Royal Auxiliary Forces! Overwatch of my entire force so far... 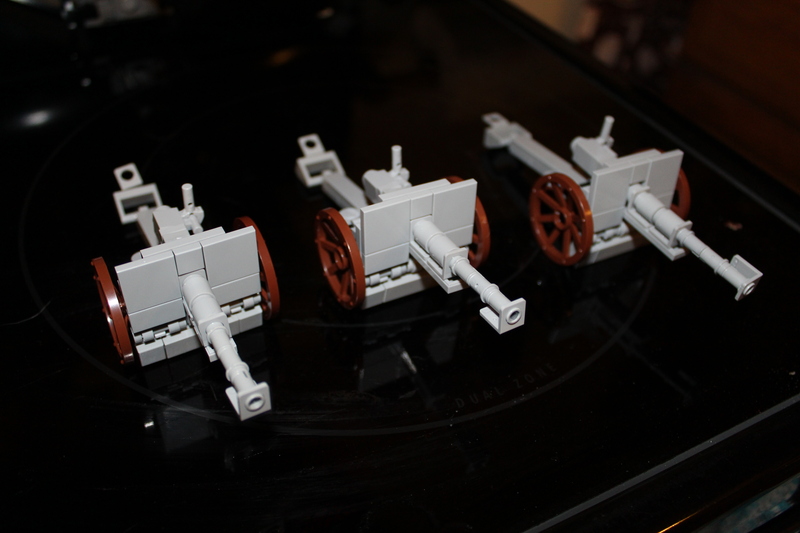 Yes I know, the artillery pieces are not very original but I will have some different stuff coming in the near future. 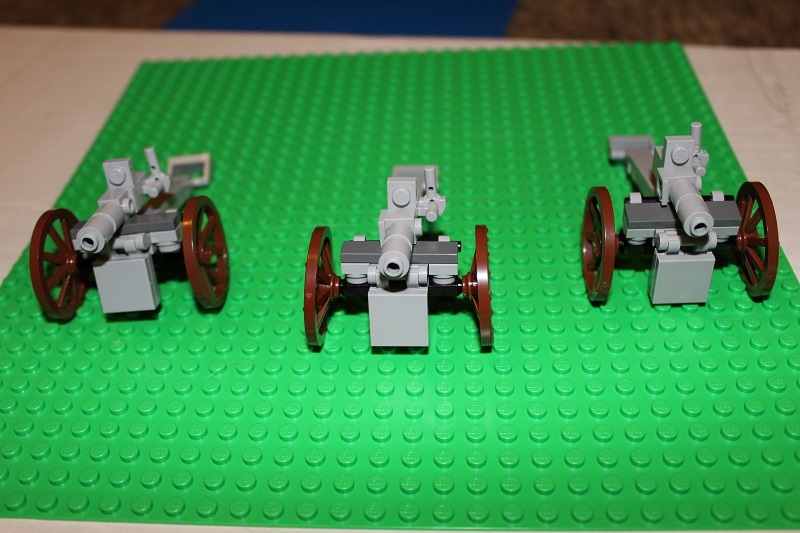 Here are three infantry sections from The 13th Light Infantry. Each section consists of 1 NCO with an SMG, a LMG team with 1 LMG and 1 Rifleman carrying extra ammunition, and 7 infantrymen. Close ups of the Arty. These men are dressed in the uniform of the Royal Army. 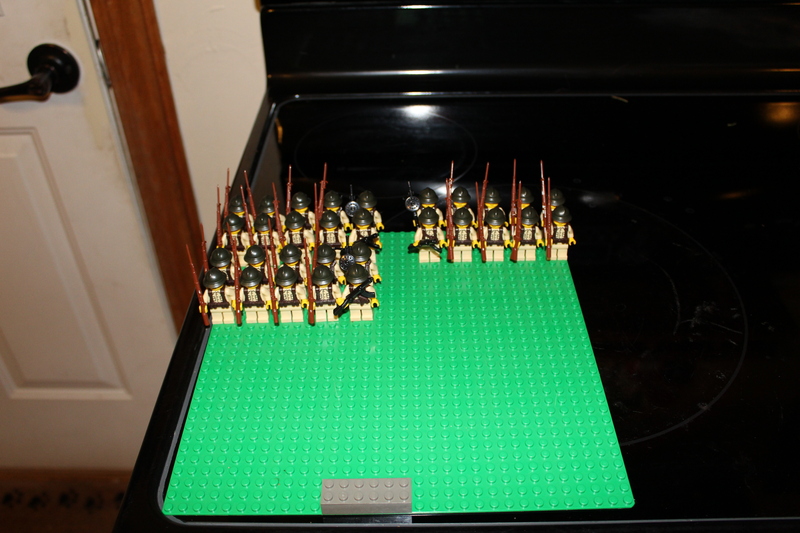 They do not have any of their field gear yet and are part of the artillery battery attached to The 13th Light Infantry Legion. -The Principality of Wisconia has been in existence since the fall of the mighty Grecian Empire fell to barbarians in the year 0 F.G.E. When the Grecian Empire fell, the peaceful people of the area known as Wisco were in disarray. 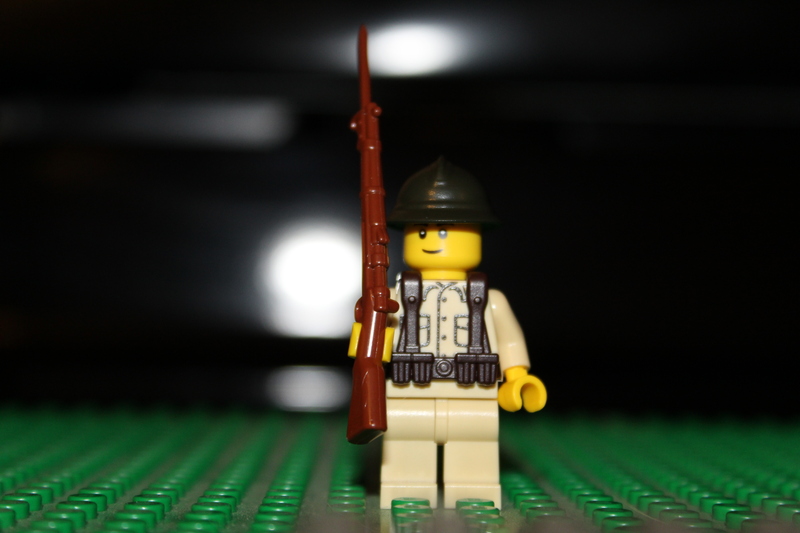 After nearly 500 years of war, famine, and death one mini-figure emerged and united the struggling bands of farmers and lumber jacks into one nation. 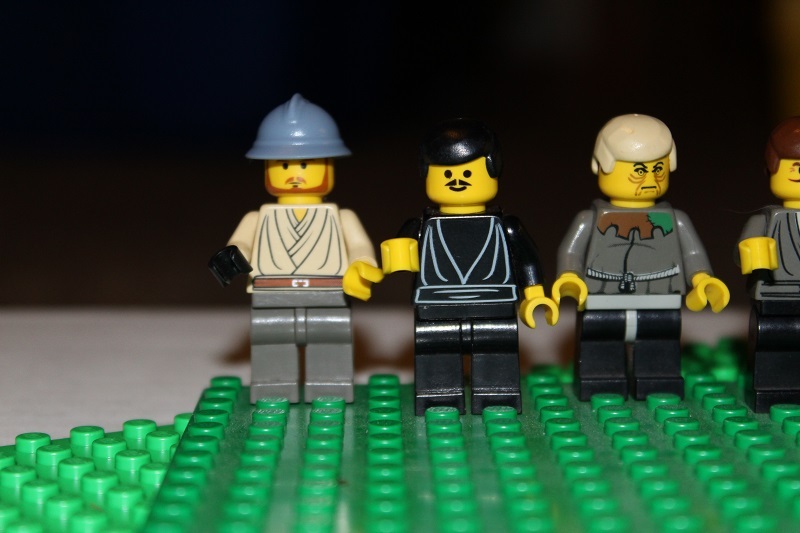 That mini-figure was known as Sir John “The Block Layer” Woodrow. 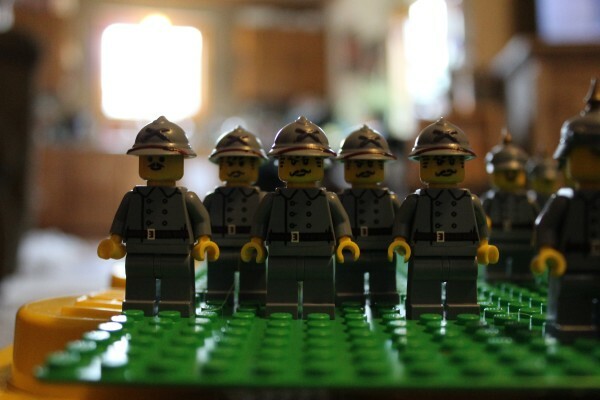 He was able to convince the individual leaders of each of the small villages to band behind him and pool their resources to secure the borders of what is now known as Wisconia. In 1805, after over 1300 years of stability and relative peace, Wisconia erupted into civil war. King Michael “The Bison” Woodrow lead his loyalist forces against separatist forces suing for more personal freedoms for all the people of Wisconia. In 1821 after sixteen long years of war, King Michael falls at the Battle of Greenville Fields and his young brother, Prince Richard “The Quiet” Woodrow assumes the thrown as King at the age of 30. King Richard, wishing to see an end to his brother’s war, agrees to a meeting with separatist leaders. In 1823 the Kingdom of Wisconia changes from an absolute monarchy to a constitutional monarchy with a parliament and prime minister. A new era of peace follows. In 1815 a major conflict erupts across the Caucasian continent. Wisconia remains neutral during most of the fighting while dealing with its own civil war. However, towards the end of the war the Kingdom of Wisconia begins shipping supplies to the Union States and in 1823 the Union States repay their war debt to Wisconia by selling their claim to South Afria to Wisconia. In 1905, King Richard II passes the crown down to his son Prince Mayhew J. Woodrow. Prince Mayhew takes to the crown at the age of 25. 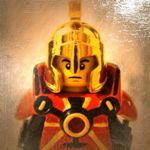 Prince Mayhew continues his father’s work on building the military forces of Wisconia. When “The Great War” broke out in 1920 Wisconia’s professional military was well prepared to face a threat such as Icrin. However, when Icrin was joined by Byzantine in their declaration of war, many within the Wisconian Royal Army saw the coming storm as hopeless. Never the less, the Royal Wisconian Army stands ready to face to on coming threat! -Wisconia’s military is divided into three separate branches. The Royal Army of Wisconia, which encompasses all land based military units including those of the Royal Auxiliary and the local Town Watch forces. The Royal Army Air Corps. is also under Army leadership. The Royal Navy of Wisconia is responsible for defending the coasts and trade routes along the high seas. The Royal Marines, while considered a sub-branch of the Navy, are ultimately under Naval command. The third branch of the Wisconia military are the Royal Colonial Forces. Royal Colonial Forces are typically raised in the overseas territories and are primarily responsible for the defense of those areas. There is a clause however, that allows the Colonial Forces to be sent to Wisconia proper in the event of an emergency. Royal Army: The Wisconian Royal Army is the professional military force of Wisconia. Most of the soldiers within her ranks are career soldiers and have experience forged from the fires of war in Afria and other regional conflicts. The Wisconian Royal Army Officer Cadre is made up of members of the aristocracy and many high ranking members purchase a commission in the military for status. Due to this, many of the Royal Army officers are incompetent and are not born leaders. Many rather, are rich play-boy types, holding military rank for personal prestige rather than service to their country. However, what the Royal Army lacks in leadership it more than makes up for in modern war fighting equipment compared to the Royal Auxiliary. Royal Army troops are some of the best equipped in the region. The Royal Auxiliary: The Royal Auxiliary forces are made up almost entirely college students or volunteers taking the first step towards earning a commission in the Royal Army. The Royal Auxiliary has minimal equipment and most units are support units. 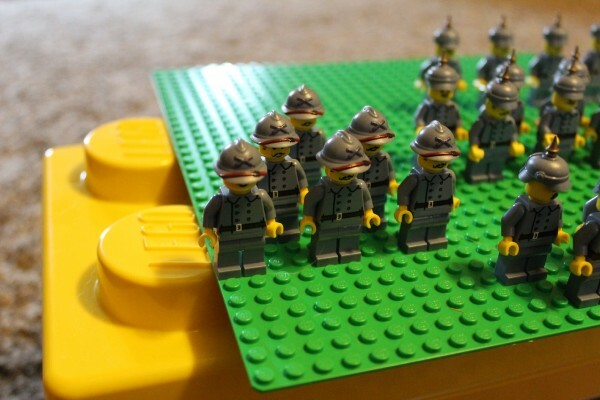 The soldiers of these units typically have no combat experience and their training is substandard. However, what they lack in training and experience, they make up for with good leadership and high morale. Most of the commanders in the Royal auxiliary are not of the elite aristocracy and genuinely care about the men under their command, seeing them as part of the same social class. Background: The Wisconian 13th Light Infantry Legion is a newly formed light infantry legion. The 13th light infantry is compromised of mostly young college students, volunteers, and transfers from Town Watch Units. Trained at Army Camp Shioc, the 13th light infantry legion was sent to the Wisconian/Icrin border, near the City of Greenhill. There they wait for an impending invasion from the combined Icrin/Byzantine forces. While guarding the frontier regions, the 13th light infantry also has the mission of improving the local infrastructure, training the local town watch, preparing defensive positions, and scouting for Icrin/Byzantine incursions into Wisconian territory. 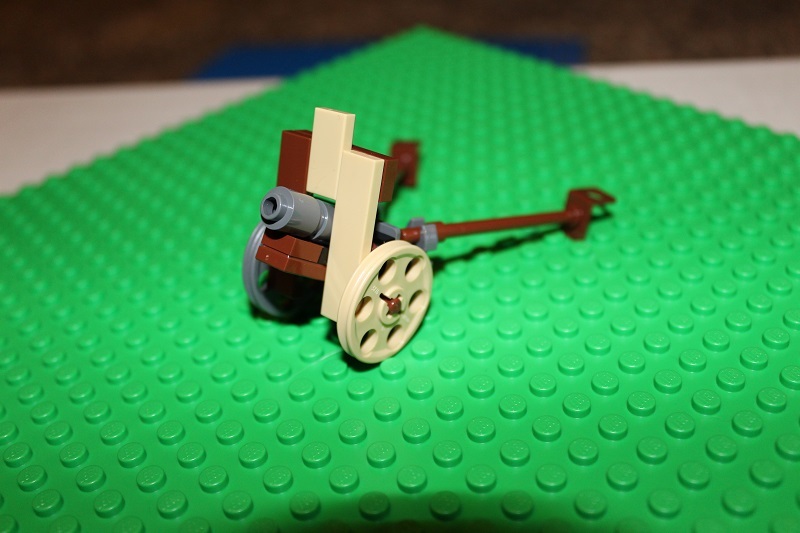 The Wisconian 13th light infantry legion is made up of Royal Army and Auxiliary units and is supported by attached light an heavy artillery batteries. Also supporting the 13th light infantry is a contingent of armor. 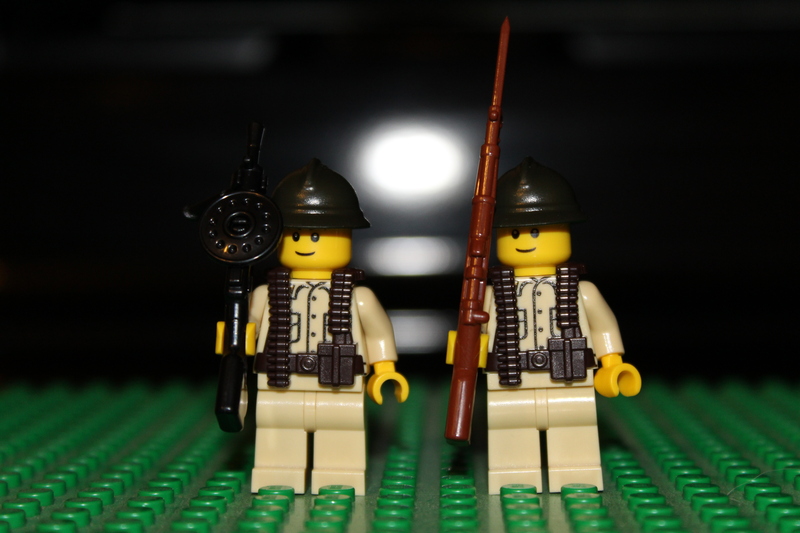 While typically the designation of "Light Infantry" is left for strictly Auxiliary infantry legions, The 13th Light Infantry Legion is unique in that it is made up of both Royal Army units and Auxiliary Army units. 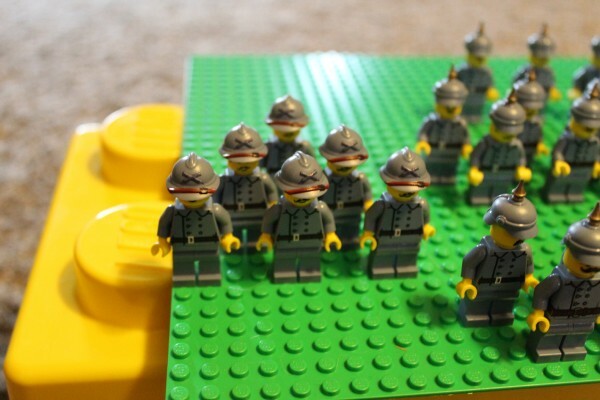 This experimental unit is an attempt by the Wisconian High Command to see if leaders of the aristocracy can effectively lead both professional soldiers of the Royal Army and the citizen soldiers of the Royal Auxiliary. It is also an attempt at seeing the combat effectiveness of both branches fighting together. Last edited by Historynut13 on Thu Feb 07, 2019 3:54 pm, edited 3 times in total. Sweet! Love it! Very well done the lore and the infantry and the weapons all look amazing and fit perfectly! Well done. However. could you do me a favor and resize the pictures? They are a little large generally anything above 800x600 is a little hard to see. I keep reading their name as Wisconsin. bann154 wrote: Sweet! Love it! Very well done the lore and the infantry and the weapons all look amazing and fit perfectly! Well done. However. could you do me a favor and resize the pictures? They are a little large generally anything above 800x600 is a little hard to see. Thanks! and sorry about the size, I will remember for next time. I'm not sure how to change the size but I will work on figuring it out. 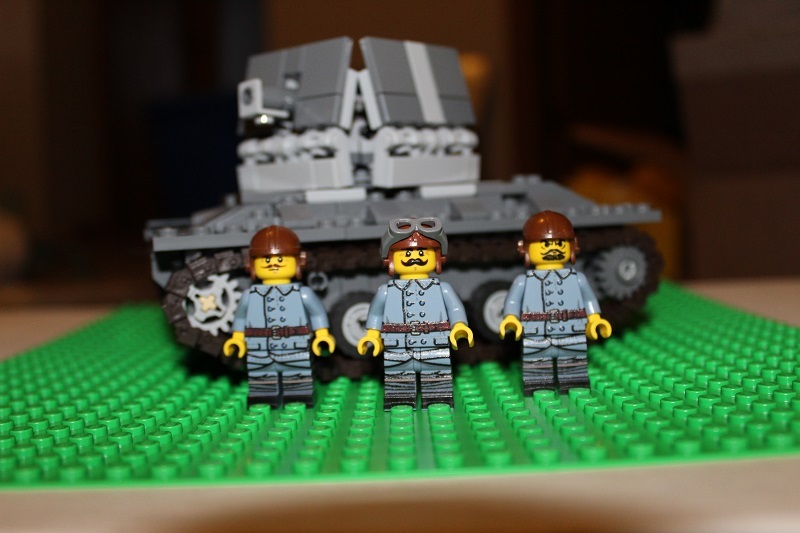 I have a tank for this force as well that I will hopefully get pictures up soon. 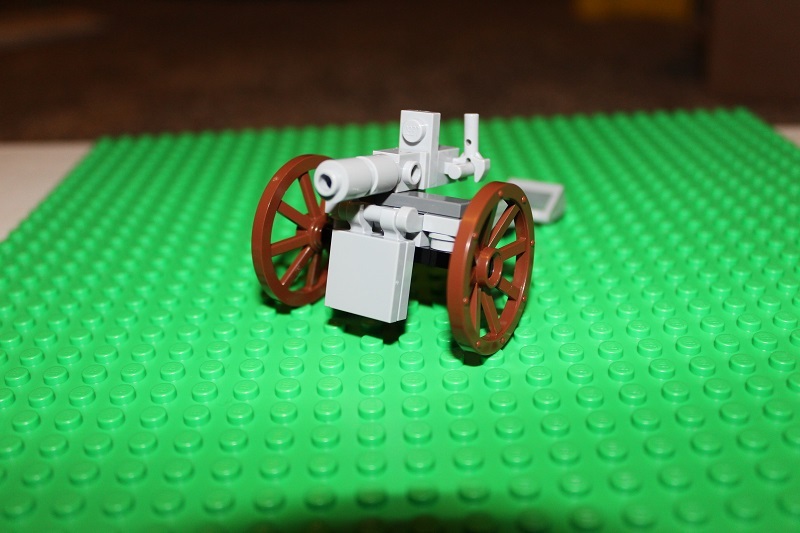 Disclaimer: The cannons are not an original design. 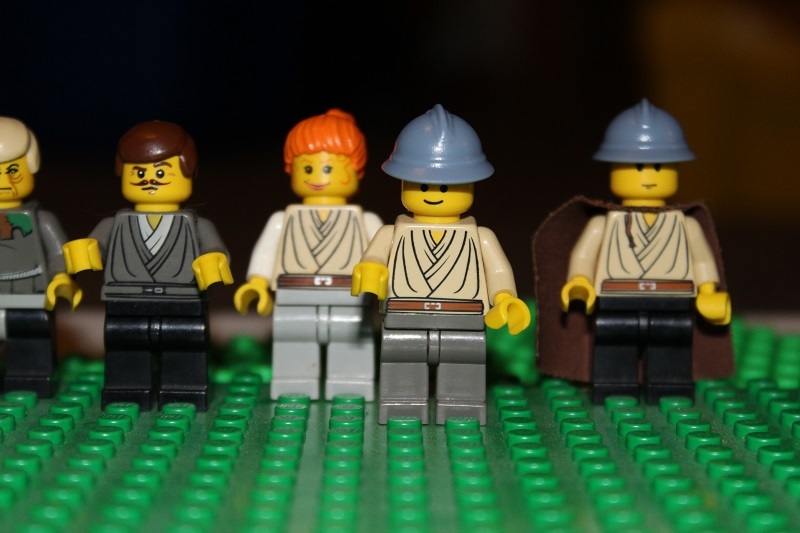 They are from Brickmania... However, I will have some original stuff soon! Greetings! I have some updates to my Wisconia forces! 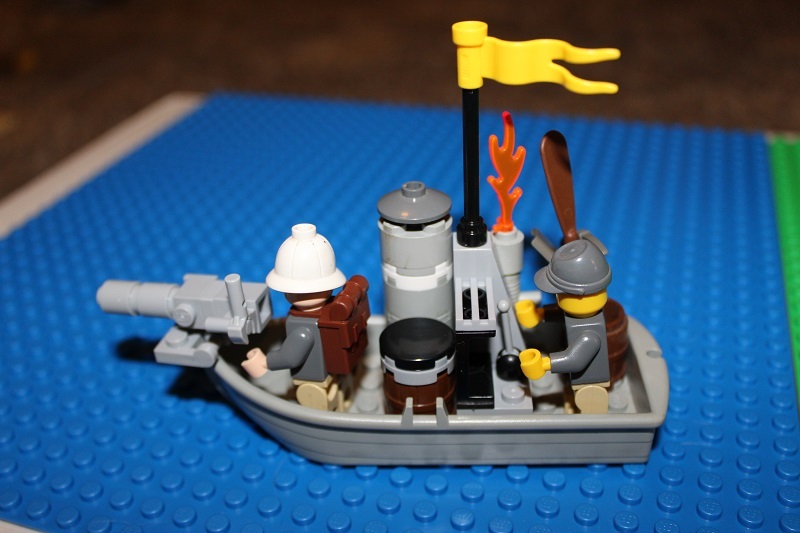 This patrol boat is manned by WIP Wisconia Colonial Forces. These boats are used to patrol the waterways in Wisconia's South Afria possession. Most of these boats are armed with Heavy Machine Guns or small caliber guns. 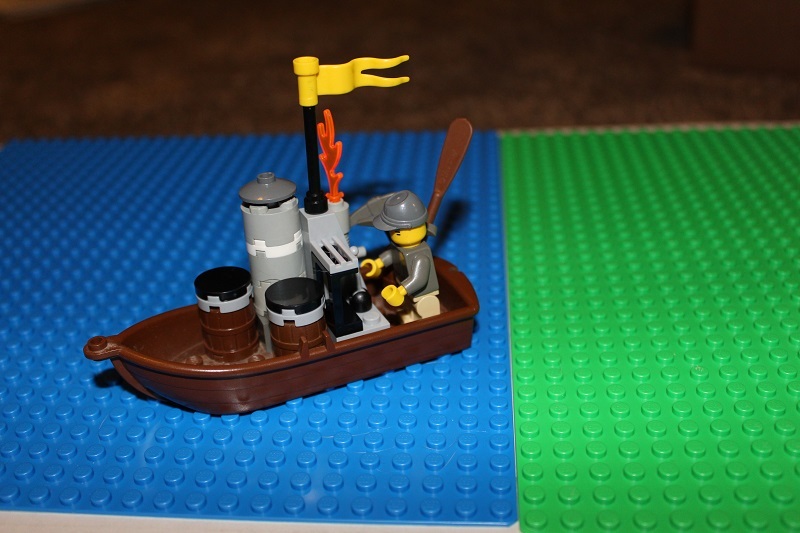 The crew typically have their rifles stowed away on board. These boats often travel in groups of 2-3 and are also responsible for moving supplies up and down the waterways. 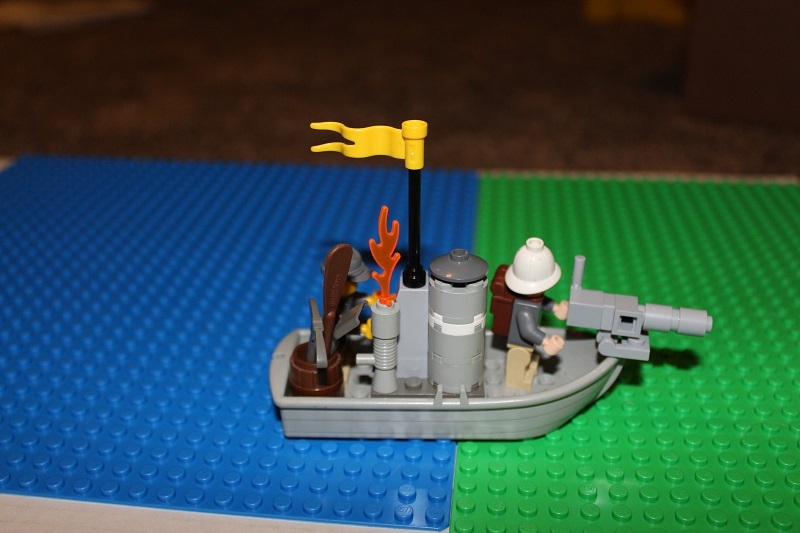 They are also utilized alongside larger gun boats. 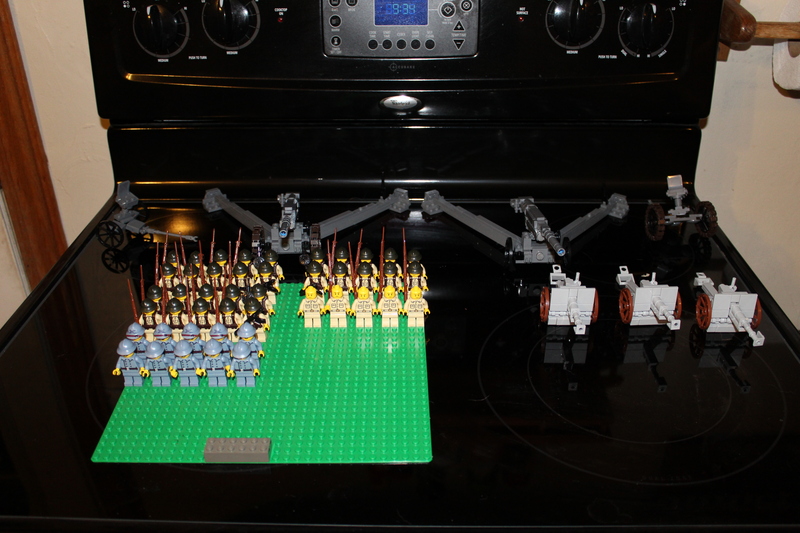 Here is a battery of Heavy Machine Guns. 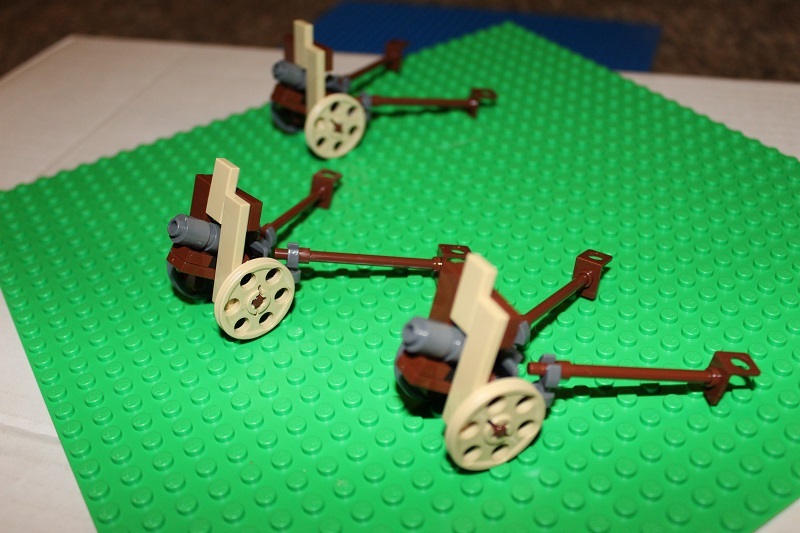 These guns are a platoon level support weapon and can be utilized by Royal, Auxiliary, and Colonial troops. Here is a battery of Heavy Mortars. 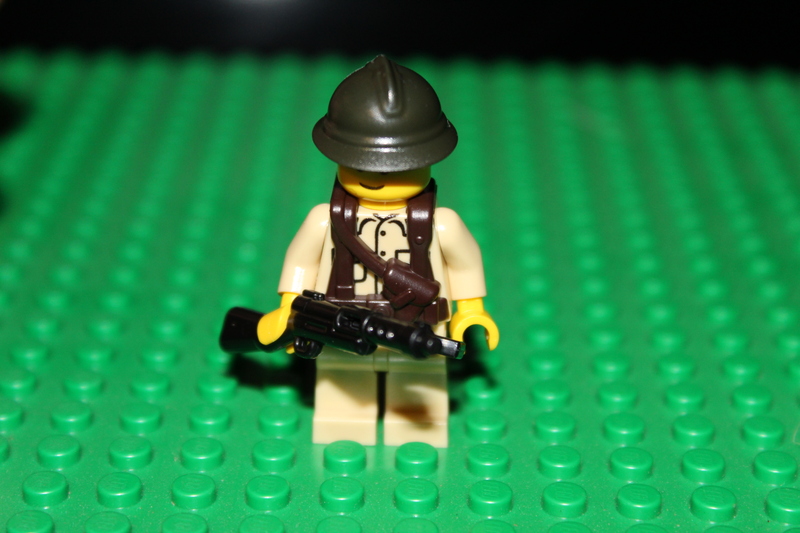 Again, these are a platoon level support weapon and can be utilized by Royal, Auxiliary, and Colonial troops. 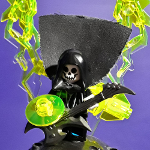 *Disclaimer: Brickmania design. 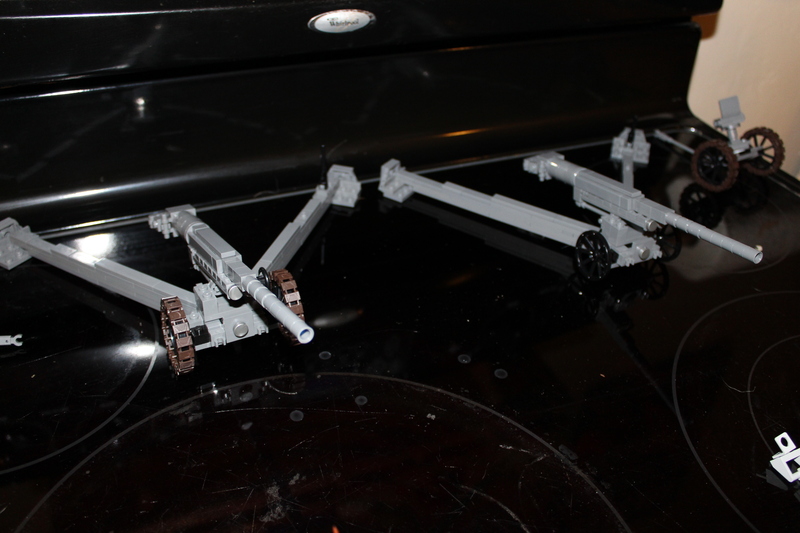 Here is the Mark I "Cyclops" Infantry Support Gun (ISG) with its crew. Wisconia's armored units are all under Royal Army command. The Cyclops is primarily used to support infantry assaults. The main gun is powerful enough to take down mechs, light tanks, and lightly fortified enemy emplacements. 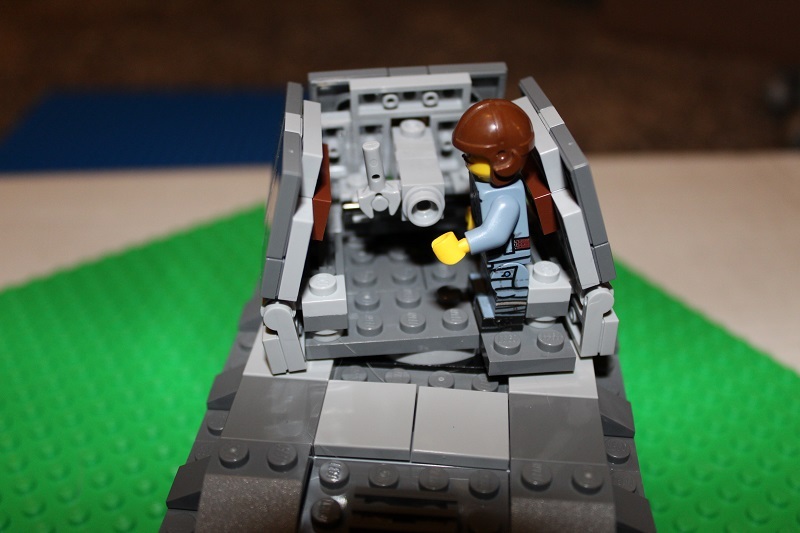 The Cyclops is also armed with a hull mounted light machine gun. The Cyclops is notorious for being mechanically unreliable. 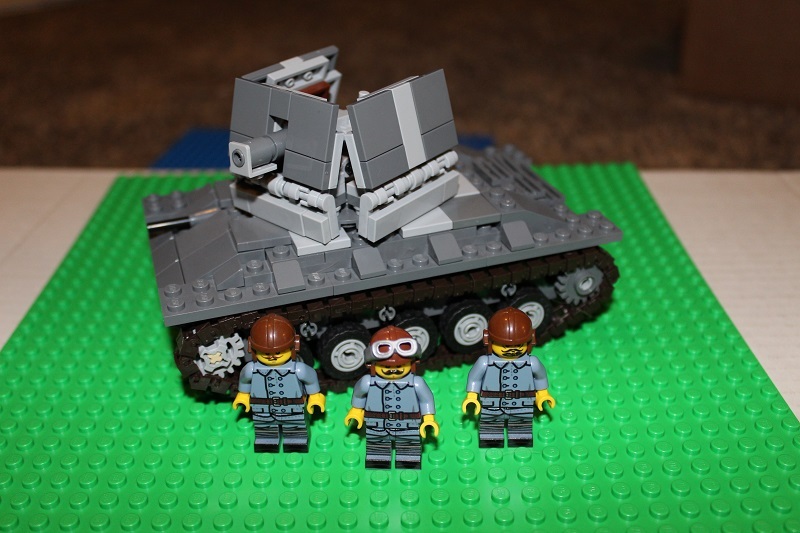 *Disclaimer: Chassis is based on Brickmania Chaffee Tank's Chassis. The lack of room in the turret means that ammo crates have to be set on the back of the tank and moved every time the turret spins. 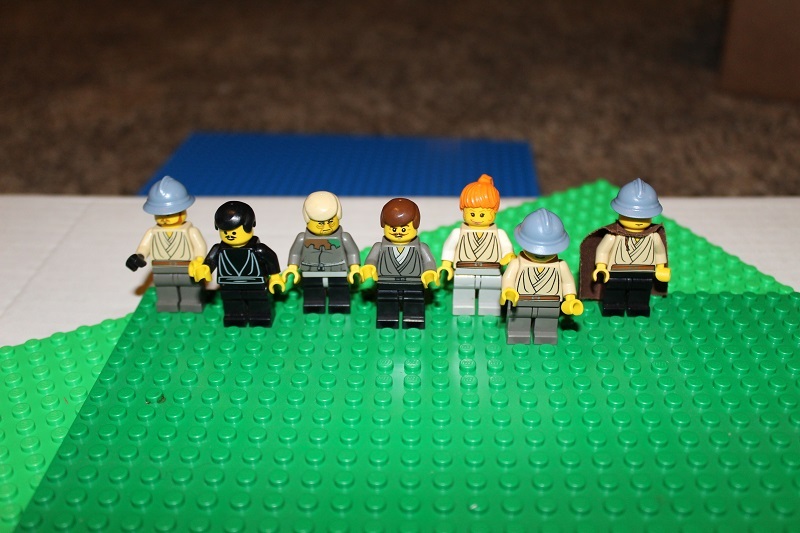 Pictured here are the members of the Ironville Town Watch. Town Watch groups are made up of local groups and do more than provide defense. They are also responsible for maintaining local roads and bridges, fighting fires, providing law enforcement services, and maintaining the general welfare of their community. Ironville's Town Watch group is poorly equipped, maintaining a small arsenal of hunting rifles and civilian style pistols. 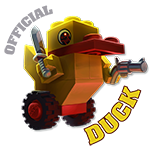 Thanks for checking out the update guys! Questions, comments, concerns or suggestions are welcome! Look forward to more to come from Wisconia and hopefully other Great War factions! More great stuff! I never really though about mounting HMG's on wheels i may have to steal that. An update to The Principality of Wisconia as well. The Royal Army infantry has been given enough men to form two full infantry squads as well as a four man special weapons squad. I'm hoping to turn the special weapons squad into a melee or close quarters combat unit. They were also provided with sand blue Pickelhaubes to give them a more "royal" feel. 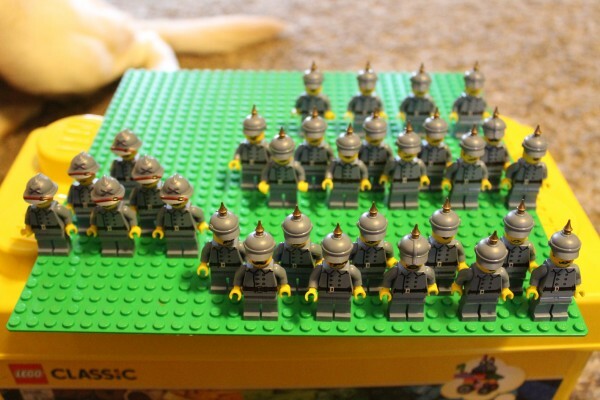 I also have six Royal Artillery gunners, as denoted by their helmets. Not a major update but it is something. Hoping to get them some more armor soon. All the pictures you posted are broken for me. Falk wrote: All the pictures you posted are broken for me. Like all of them or only the new ones? I can see them when I preview the post. 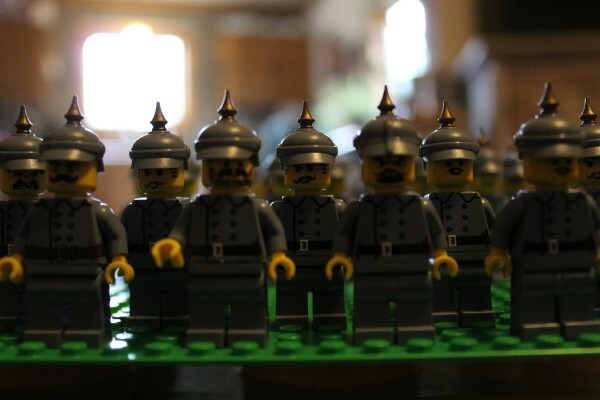 where did you bought those pickelhaube helmets?